Seishun Gakuen 3rd Year Class 4 Birthday: 18th November (Scorpio) Height: 180cm Weight: 65kg Blood Type: A Dominant Hand: Right Play Style: Aggressive Baseliner Shoes: ASICS (GELSTROKE) Racket: DUNLOP (RIMBREED XL) Special Move: Burning Serve, Power Tennis Favourite food: Mushitake mushroom soup, fish roe rice bowl Hobby: Playing Monopoly, Sharpening knives (Still training) Family: Father, Mother, Younger sister Father's occupation: Self-employed (Sushi shop) Favourite Subject: Mathematics Favourite Colour: Light Blue Preferred type: Girls with good figure (The slim type) Kawamura is a modest student and a very hardworking son. However, he changes everytime he holds his tennis racquet (or anything, for that matter) from a meek, quiet student into a loud, bold and agressive person. He also talks in Engrish most of the time. 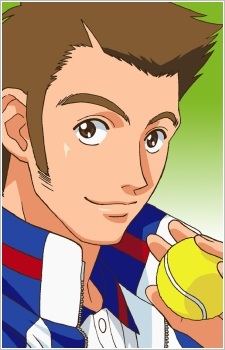 His power tennis surpasses those of other Seigaku members although he tends to be careless when making decisions.